Sunderland is well known for its bars and nightclubs, so we've taken a look back at some of the old haunts Sunderland graduates used to go to that have since vanished. If you're of a certain age, some of the names are instantly recognisable. Click through the photos in the tiles below to revisit your misspent youth in places like Wearmouth Bar, Manor Quay, Annabels, Ku Club, Rascals, Chambers, The Palace and Bentleys. Sunderland Polytechnic hosted two Students’ Union bars, one on each of the main sites: Wearmouth Bar and Carlton Bar. Hidden in the depths of Wearmouth Hall, Wearmouth Bar could be reached by walking round left, beyond the revolving doors of the main building. By the 90s Wearmouth Bar was well known for fairly priced lager, just enough room to wield a pool cue and had a 10 pence charge for ‘non-members’ to enter the building. In Wearmouth Bar you could find that traditional Students’ Union feel with an amazingly friendly and buzzing atmosphere. To some it was a 1960’s concrete carbuncle on Chester Road, to others it was home to fun, frolics and long nights of studying in the run up to finals. Carlton Bar, situated in Carlton House on Mowbray Road, had two function rooms which could be used by Clubs and Societies for fundraising events or simply for parties. 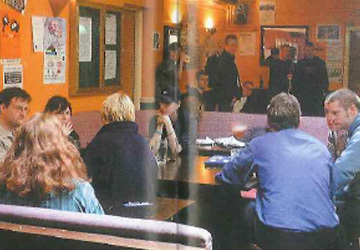 Carlton Bar was popular in the late 80s and early 90s with the football team and students from the Halls in the area. As the Polytechnic Students’ Union Handbook 1985-86 describes: “The Bar was mostly frequented by the backhouse arty crowd”. Popular student nightclubs during the Poly days were Chambers on Monday and Wednesdays, Annabels on Mondays, Ku Club on Tuesdays and The Blue Monkey on Thursdays. Other pubs students used to go to were Salem, near Carlton; Bush, two minutes away from the Salem; Ivy House and The Royalty (currently known as The Stumble Inn), near Wearmouth, among many others. The change of the Polytechnic to University status saw some changes with the introduction of a permanent Entertainments Manager, Dave Corbet. In the past, Entertainments had been handled by a student sabbatical officer, so the introduction of a dedicated manager brought in experience and continuity. 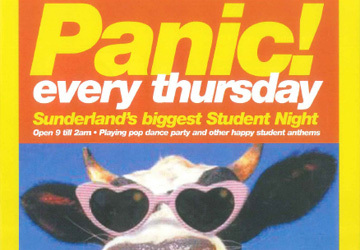 In 1994/95 the University opened the St Peter’s campus and the Students’ Union started operating its own nightclub Manor Quay, developed at a cost of approximately £1 million. The multi level venue had four bars selling drinks at the Union rate (an average of 40% less than most other outlets in the area). The 1,200 capacity nightclub had a large dance floor and hosted special events, live gigs, formal balls, cultural events, comedy and cabaret nights, and of course the Manor Quay’s immensely popular club nights. The club nights varied from Relax on Wednesday, 60s, 70s and 80s night and Amnesia on Fridays. Saturdays were Retrospective, featuring live bands and a music in the round. Some may also remember Fruitful dance nights which used to take place once a month hosting artists such as Judge Jules, Tony de Vit, Boy George and Danny Rampling. In 1998 Fruitful hosted the regional leg of the DJ magazine mixing championships. Special events such as Fresher’s Ball, Halloween and Christmas Parties, and a Valentines Ball were also held at the popular venue. Artists like Jools Holland, Ocean Colour Scene, Northern Uproar, Terrorvision, the Chicago Blue Brothers, The Wannadies, and DJ’s like Judge Jules, Love to Be, to name but a few, played to packed audiences. As well as music Manor Quay played host to comedians, for example Craig Charles and Charles Chuck. Manor Quay and Wearmouth Bar became hub of the nightlife in Sunderland in the late 90s. Free shuttle bus services ran between the Bar and Manor Quay at regular intervals each night. “The taxi drivers used to have a call sign which was ‘Fraggles to Fraggle Rock’, which meant a student pick up at Wearmouth Bar and drop off at Manor Quay. That still makes me laugh,” said Matty Pendergast, the Students’ Union President (1997/98). The social scene back in the late 90s was quickly changing. Carlton Bar closed in 1996 while other Sunderland pubs and bars embraced a new era with changes. New pubs and clubs opened and some of the clubs replaced one another. 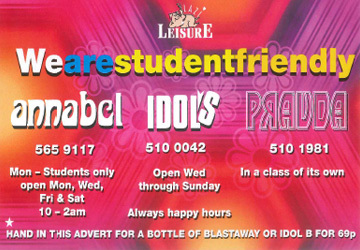 For instance, Bentley, on Holmeside, became Pzazz in 1994- welcoming a new generation of clubbers. It closed, however, in 2004, later re-opening as Passion. Today it’s known as Illusions. David Willey, the Students’ Union President (2005/06) explained: “There was never a typical night out as during my time in Sunderland, we were lucky enough to have new bars and night clubs popping up and opening nearly every week. However, the night would usually start off in the Wearmouth Bar and end in the famous Manor Quay – especially on a Wednesday night! 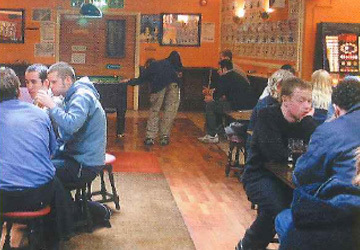 In October 1998 the Students’ Union opened the Bonded Warehouse bar/café- the Union’s venue adjacent to the Halls on Panns Bank and at Scotia Quay. Regular events were held at the venue including resident DJs at weekends, quiz nights, karaoke, comedy nights and live acoustic bands. Today the bar and the function room at the Bonded Warehouse are still used for students and University staff. In 2008 Manor Quay become Campus, later re-opening as North Shore in 2010 as a new student multi-functional centre. The venue currently presents student productions, live bands and is the main hub of the University’s Freshers week activity. 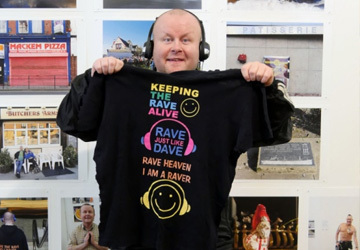 And on a final note... who can forget Dave the Rave!! Have we missed any venues? Let us know at alumni@sunderland.ac.uk. Also if you have any photos of these bars and clubs then please send them to the email above.